Queen duvet cover (88" x 88") featuring the image "Saint" by Michal Boubin. Our soft microfiber duvet covers are hand sewn and include a hidden zipper for easy washing and assembly. Your selected image is printed on the top surface with a soft white surface underneath. All duvet covers are machine washable with cold water and a mild detergent. Perfect timing, wonderfully captured, Michal! Congratulations on your sale!!! Thank you very much, Xueling, for your comment and congratulations! 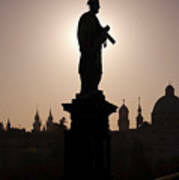 Baroque statue of St John from Nepomuk in the Charles bridge at Prague. 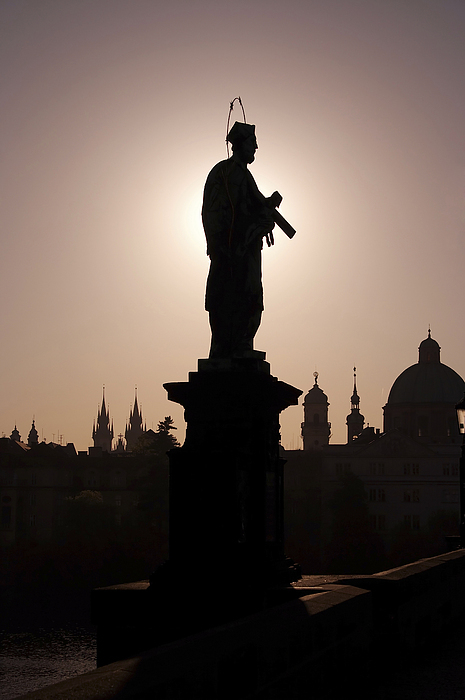 Charles bridge - the oldest preserved Prague bridge, founded by Charles IV in 1357. 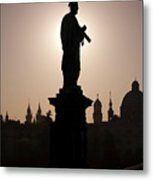 Prague, Czech republic, Europe.